In my weekly search for recipes for the blog, the most intriguing are the salmon curing recipes. Growing up in Vancouver, I have only ever had salmon cooked or raw sushi grade salmon, but never cured. I can only imagine how delicious it must be. Here is a recipe from St. Louis Today that calls for beets and beet juice as a part of the curing process. 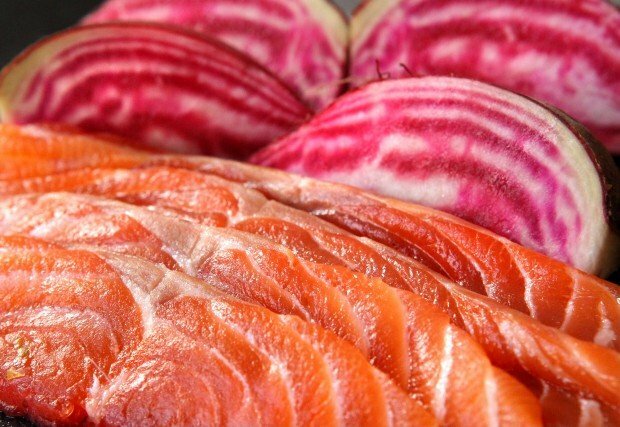 This is a timely recipe as beets are currently in season and salmon should be fresh as the fisheries ended recently. 1. Rinse salmon and pat dry with paper towels. 2. In a small bowl, mix together grated beet and its juices, salt, sugar, lemon zest and vodka (if using). 3. Place salmon on plastic wrap and completely cover it with beet mixture, being sure to get some on the skin side as well. Wrap salmon thoroughly in plastic wrap. 4. Place plastic-wrapped salmon on a shallow baking dish and refrigerate for 24 hours, weighing it down with canned goods or other heavy items. 5. Remove salmon from plastic wrap. Rinse off cure under cold running water, then pat dry with paper towels. Slice as thin as possible and serve. Can be refrigerated up to a week or frozen for several months. Should shark fin soup be banned?